Why do so many councillors want to pervert the democratic process by which they themselves were elected? Why do those same councillors foist their personal racist views on to their ratepayers? They do so on the flimsy excuse that it’s too costly to allow ratepayers a democratic vote. And then – to add insult to injury – they moan loudly about the greater cost, afterwards, when the higher cost aftermath of a retrospective poll is totally and absolutely a consequence of their unilateral racist actions. I.e. An increased cost to ratepayers that is entirely of the councillors’ own making! Councillors cannot be ignorant of the fact that the cost to ratepayers exercising their democratic rights to reverse their council’s racist proclivities will cost so much more than asking ratepayers in the first place! Or do those councillors actually know, but simply don’t care? The “we were elected to govern” syndrome. Ring a bell? Almost every time that democracy is given a chance, the racists lose. But the pro-racist councillors among us just don’t get it, do they? Keep in mind that – no matter what – the cost of council democracy is always borne by ratepayers. The Kaikoura District Council voted to establish a Maori Ward at the next election but Hobson’s Pledge said voters need to make their own decision. 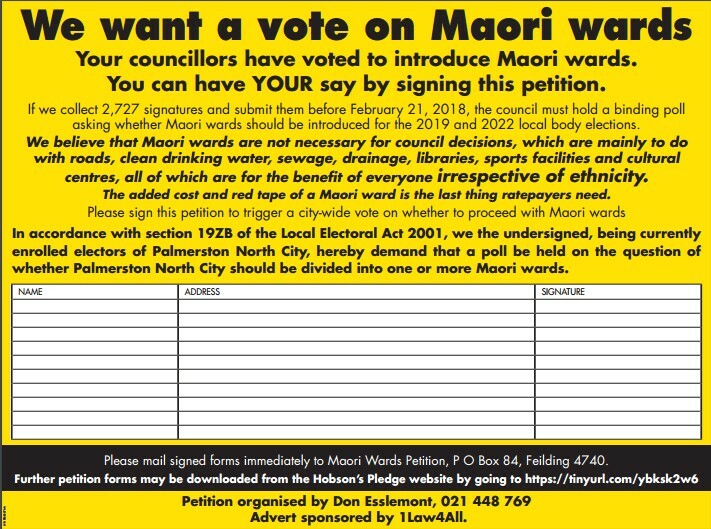 However, Rakautara woman Ngaio Te Ua said it was discriminatory that legislation penalised the forming of a Maori Ward by allowing five per cent of the electorate to demand a binding poll which could overturn the unanimous decision. There you have it! Not only is democracy discriminatory in the eyes of part-Maori racists, democracy also penalises those same, poor racists. Tut, tut! How could that be? If you’re a ratepayer in Palmerston North . . . .
. . . Connecting . . . the . . . dots . . .
Part of the reason lies in the fact that a large majority of people are really not aware of the history of democracy – in this country and in the UK where the basis of it comes from and also fail to identify the major aspects that in fact make a democracy. Then they also fail to realise what happens when democracy is undermined. Couple this with the people who deliberately want to undermine our democracy and you really have trouble. Next step for them is going to be the political decision (already in train) to do away with any vote on separate Maori wards. Don’t count on National to oppose this either! I wonder that as well. When I have questioned people a frequent reply is that they find the whole thing exhausting and simply tune out. I think that this comes from our natural tendency to avoid conflict and the proponents of the racial policy are nothing if not agressive – just check the ones who patrol facebook pages – those of Hobson’s Pledge for example. The other thing that occurs is that few people see the long term damage and the huge problems that the policies we are currently following will produce. Love to hear some suggestions as to how to combat all of this.